We’ve been scrambling to catch up with admin and freelance work while fighting off con crud, so this post is a bit overdue. The TL;DR version: FanCon 2016 was really, really good, and we plan on attending future ones! We’re also very proud of Readers Den and the local comics community. Behold! 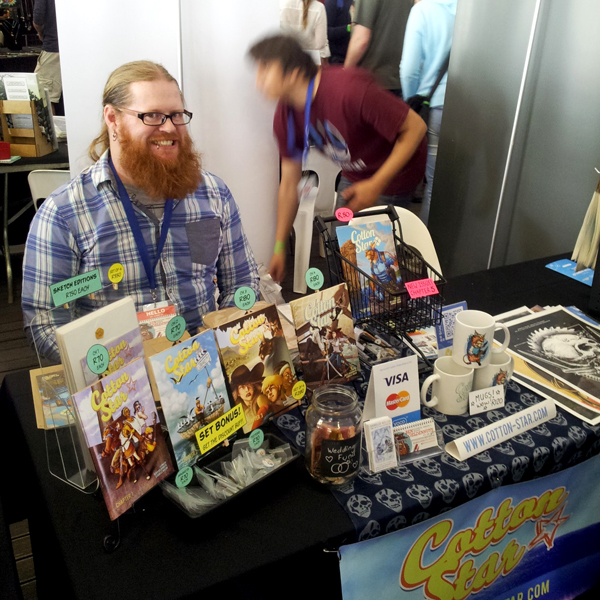 Our little booth… with the last ever appearance of the Wedding Fund jar! It had a good run. The inaugural FanCon was really good. The organisers mentioned beforehand that they were expecting around 3000 people, but just over 4000 people ended up attending. Although these numbers might not seem that impressive when compared to overseas cons – trust me when I say that this is a healthy amount for South Africa. This is the first successful official comic con we’ve ever had as far as I am aware. Other well-attended nerdy events here are mainly generalised geek cons, focusing mostly on video games, electronics, audiovisual entertainment and other multimedia related things. FanCon is 100% focused on comics and although there is a gaming and media element, it is by far outweighed by comics culture. What we really loved was the strong focus on local IP and self published works. Local creators have long been encouraged by Readers Den to sell their own art and publications, and the market response to this has been great. In turn, we are seeing a rise in the quality as well as the quantity of local IP/publication. It’s very validating to have someone invest their money in your work. Any content creator will be able to tell you as much. It’s one thing to have tons of people tell you they like your work, and another thing entirely to have the same amount of people do the talking with their wallets! It’s a great feeling. Heyyy buddy! Let’s Earl Grey it up in here! The cosplay was also amazing – we saw a whole lot of insanely good cosplays by both newbies and veterans alike. 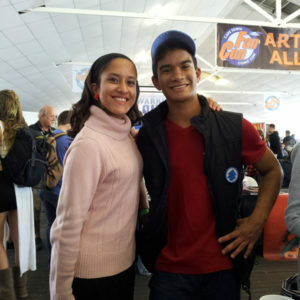 We saw a Dipper and Mabel, who were so perfect because they were twins in real life too! 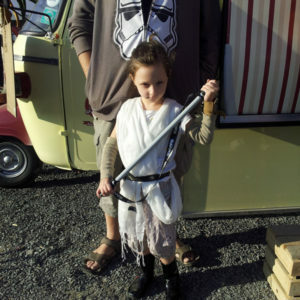 We also saw a few Undertale cosplays, a really great Bravestar, a tiny adorable Rey who was really into her character… the list goes on! We tried to get pics but honestly there was so little time to just walk around and document. Plus I was trying to save my phone battery for our wireless card reader. We’ve got links to loads of photo albums at the end of this post. Go check those out. How awesome is this kiddo?! Mabel and Dipper cosplayed actual twins! One of the highlights of the day! We also heard that the international guests had a positive experience with their panels, signings, etc. and will be vouching for the show should others ask them about it. This is excellent news as guest speakers and interesting panels are such an integral part of what makes cons work. We have our own wishlist of who we’d love to have over but since Readers Den funds all guests out of their own pocket, we’ll be patient and hope for the best. It was also really lovely to finally meet Jason Masters in person! We’ve been chatting on twitter for a long time and he is just a great human. You can follow him on Twitter here and on tumblr here. I felt like a dingus though because I said hi to him not knowing it was him. Only later on did I click that the familiar looking bearded guy I greeted earlier at the door was actually Jason. Fail. I snuck a shot of Sean Izaakse and Jason Masters being interviewed… which earned me a glare from the crew. Sorry crew! Of course, the con was not without hiccups. The huge attendance was a pleasant surprise with a few unpleasant side effects. We were very fortunate with weather, it was sunny but cool and pleasant on the first day, because otherwise I doubt people would have waited out the 45mins-2hr INSANE MOFO OF A QUEUE that had formed… seriously, it stretched for about a block! I think even Readers Den were surprised at the turnout. There was some confusion in the queue too – people who already had tickets were queueing along with people who wanted to buy tickets at the door. This resulted in said insane mofo queue, and at one point I think they ran out of arm bands and then the queue was told they ran out of tickets, and a whole bunch of people just ended up leaving. The problem was resolved later and the next day, however, as they set up marshals to deal with the ticket confusion and queues. I chatted with one of the organisers, and he mentioned that they will definitely be better prepared for the huge influx of people next time. 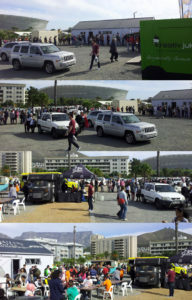 After all is said and done, we were all extremely pleased that there were so many people. It’s a sign of a healthy local industry, and a community excited about where things are headed. Most of all, they prove it by financially supporting the event and vendors. Seriously. This queue was nuts. I took these shots panning left from the entrance. 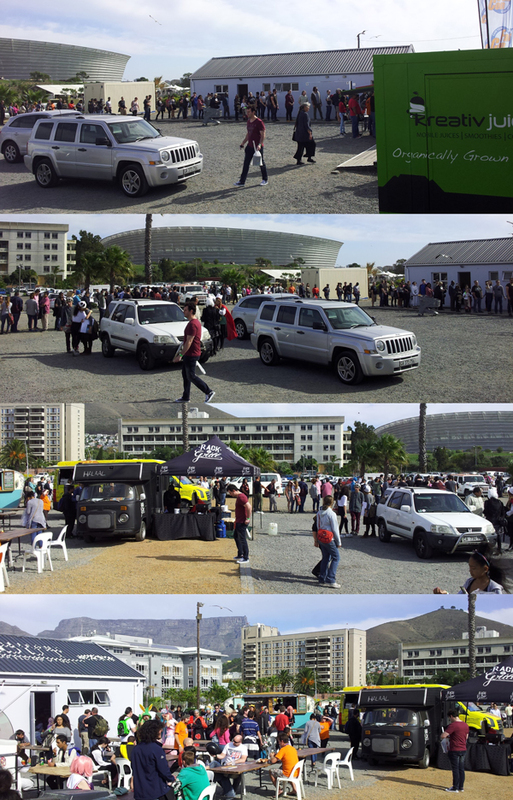 The queue extended around that building, and turned a corner and continued along the street. Our profit margin wasn’t huge, but it was decent, and the fact that we had one at all was great. Our expenses for this con were quite high as we had to print Chapter 5, order mugs, do poster prints, as well as purchase a wireless card reader to take card payments. We were really nervous about that purchase, because it was a lot of money to put into something which we weren’t sure would pay for itself. We ended up just pinching our eyes shut and going through with it. And we are so glad that we did! The card reader was responsible for about a third of all our takings. We wrote a little info thing about the reader at the bottom of this post. You can check it out down below. Thank you, you beautiful little gadget! We really needed this show to work in our favour because we have a lot (and I mean A LOT) of deposits due this month for the wedding. We essentially put a big chunk of our wedding deposit money into FanCon, because of our faith in Readers Den and our experiences with their extreme competency in the past. It was like 80% faith and 20% blind hope that the crowd would not disappoint. And both delivered! We are so grateful to everyone involved. Really we are. You are all wonderful. We do have a bunch of stock left, including lots of Chapter 5, posters, and a very limited number of mugs. You will be able to purchase these from Indiecomics soon. We are delivering stock to them tomorrow so it should become available within the next few days. Keep an eye on our Facebook page and Twitter account for announcements. Photo albums: Official Readers Den/FanCon albums can be found on their Facebook page. Videos: Grant Hinds did two videos; and we quite liked this one from Flip Side Vlog. And More: Zombiegamer did quite a thorough job of rounding up all the articles, videos and photos of FanCon. You can check all that out here. You just have to scroll down a little bit until you get to the FanCon section. 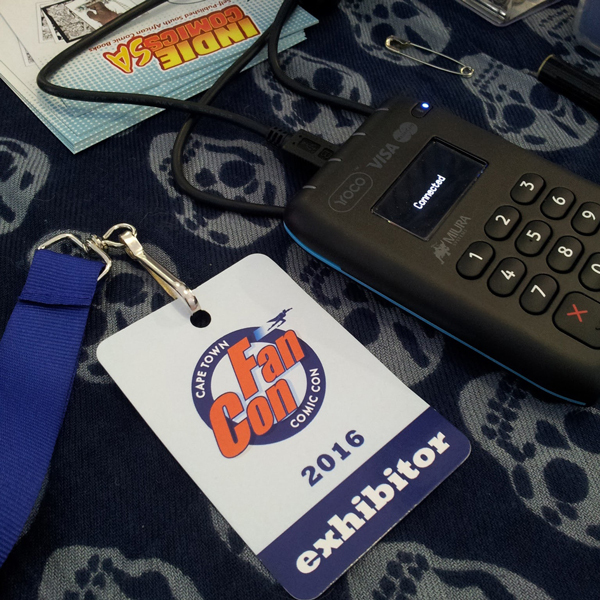 That’s all from us about FanCon 2016. We have some more stuff to talk about, but we’ll make a separate blog post for that as this one is already super long! Once again, a huge thank you to all involved! 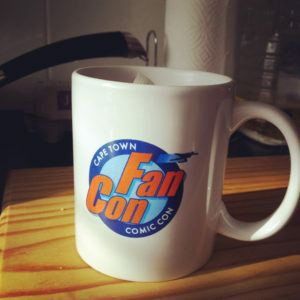 FanCon was awesome, and so are you.